Gerald Kenneth Harper, 88, journeyed home to heaven to be with his bride, Ella on October 31, 2018. Gerald was born on October 14, 1930 to Wilbur and Irene Harper on the Harper homestead in the heart of the Bull Mountains. Gerald was the baby of the Harper family. He had six siblings, Ed, Harvey(Buck), Robert(Bob), Dorothy(Dot), Paul and Mildred(Sis). Gerald was proud of his Montana roots. The Harper family moved from Indiana and settled on a homestead near Roundup in 1912. All Gerald’s siblings were born, went to school, and lived at the Harper homestead until 1938. The Harper family added to their roots in 1938 and moved to a small house along the Musselshell River. Life was not easy for Gerald. He experienced The Depression and the loss of his father at a young age. At the age of 21, Gerald met the love of his life, Ella, through his brother Buck Harper while in Monticello, Maine. After a long-distance courtship and many letter exchanges, they were married on October 14, 1953. He stole the heart of Ella and they headed for Montana the day after they were married. Grandpa always said, that grandma never looked back. Together, Gerald and Ella had four children, Wilbur, Jim, Barbara, and Penny Sue. Gerald was a farmer and rancher at heart. 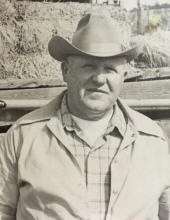 His love and devotion to the land and animals helped him establish a beautiful ranch west of Roundup. The multiple gardens and trees around his house were evidence of his love for nature. He enjoyed tending to his crops and being outside. Growing plentiful gardens, harvesting the hay and corn from the fields was his livelihood. Gerald is survived by his; sons, Wilbur (Laurie) Harper, Jim (Lisa) Harper of Roundup and daughter, Barbara Booth of Billings; grandchildren Nicole (Ben) Hanson of Roundup, Jeremy (Jamie) Harper of Powderville, MT, Pernnell (Mary) Booth of Aumsville, OR, Kammille Booth of Billings, Cody (Lindsey) Harper of Roundup, Cassie Harper of Roundup and ten beautiful great-grandchildren. A viewing will be held at Wier Funeral Home in Roundup from 6PM-8PM on Monday, November 5th. Funeral Services will take place at Zion Lutheran Church in Roundup on Tuesday, November 6, 2018 at 11:00 AM. Graveside services will immediately follow at the Roundup Cemetery. Pallbearers are Jeremy Harper, Cody Harper, Ben Hanson, Greg Wennemar, Pernnell Booth, and JaQuawhann Booth. Honorable pallbearers are Raymond Raths, Gary (Budda) Robson, and Lance Gordon. A luncheon will take place immediately after graveside services at Zion Lutheran Church. Memorials can be made to Zion Lutheran Church or the Musselshell/Golden Valley 4-H council or the charity of one's choice. To plant a tree in memory of Gerald K. Harper, please visit our Tribute Store. "Email Address" would like to share the life celebration of Gerald K. Harper. Click on the "link" to go to share a favorite memory or leave a condolence message for the family.